Duff filled in or Tommy who either had an injury or where busy with The Replacements. Happy Easter!! Good 2 b home! Lookin' 4ward 2 the Golden Bods.... I mean uh... Gods!! Yeah! Those too!! Great to share a stage with my bro @axlrose over these past few weeks. The guys in the band were super cool to this 'outsider'.MissTheSongs. Not a bad show at all. A little better than I expected. @Soulmonster wrote: Not a bad show at all. A little better than I expected. Yes, I think this is pretty good performance. 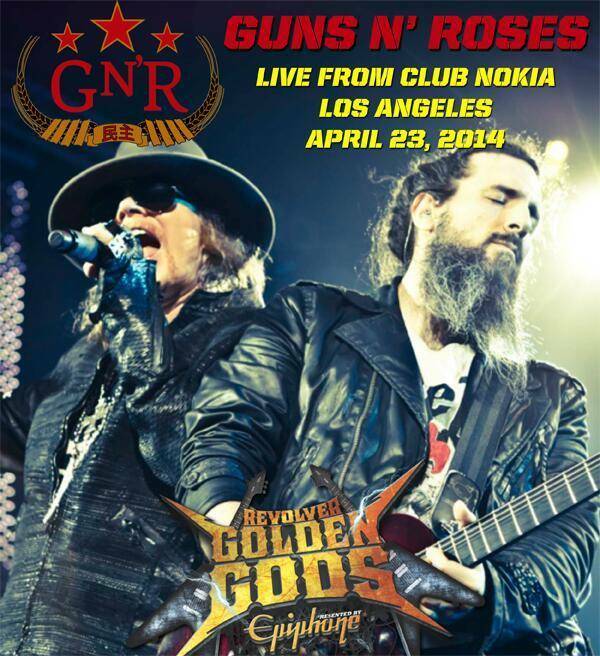 And lastly, Guns ‘N Roses took the stage as the headlining live act of this event, playing a surprisingly long set which lasted for about 75 minutes and spawned 11 songs, certainly not the norm for these Golden Gods shows wherein no band has ever played more than 3 or 4 songs. There was a 15-minute lull before they appeared at 10:45 PM, and the same old rumblings of Axl Rose’s lateness started circulating amongst people in my vicinity, some even speculating whether Axl was going to play the show at all. But the band came out and delivered more than what anyone would have expected, featuring the return of bassist Duff McKagan not only to boost the rhythm section and backing vocals but also to give the band a more ‘legit’ collective persona specially in the eyes of those who’re fixated on the classic lineup. Granted, Axl Rose started out sounding uneasy on the vocals but from the fourth song onwards, he upped his level, and slower songs like ‘Better’ and ‘This I Love’ allowed him more breathing room which in turn resulted in him giving his 100 per cent on the last few songs of the set, including the beautiful ‘November Rain’ and culminating in a great rendition of ‘Paradise City’. Guitarists Bumblefoot, DJ Ashba and Richard Fortus were excellent as always, playing the songs with absolute perfection, and besides the GNR songs they played a couple of delightful little jams as well, including Bumblefoot’s intro teaser of Zeppelin’s ‘Babe I’m Gonna Leave You. Together, all eight members of the band combined to deliver an excellent Guns ‘N Roses set, which in the honest words of my photographer/friend Matt Nielson, was a lot better than when he saw the band back in ’92. That in itself speaks a lot for the current lineup, and I would urge people who hate Guns ‘N Roses without giving them a semblance of a chance to go check out a live show (not a live stream, an actual show) and decide for yourself. My only complaint from this set would be the excessively long version of ‘Knockin’ On Heaven’s Door’, which if shortened down would perhaps serve the band and their audience a lot better. Other than that, this GNR set was an apt end to an event that began on a fantastic note and had a lot of filler in between. Strange, I listened to the show and I thought that the first couple of songs sounded better with Axl w/ raspy voice, while songs like TIL and Paradise city did not sound particularly good. I can't remember the last time I heard a live version of Paradise City where I thought Axl sang really well. That song needs a lot of rasp and breath and since it usually comes late in the sets it's too hard for Axl. As for the This I Love at this show, I liked his voice. It gave the song some vulnerability and took away some of the pompousness. "We got a mini show! 9 songs, and even the confettis didn't fail to appear, no exception! In my opinion, the choice of songs was representative. A special moment for the fans there: during This I Love, Axl lost his ear monitors. He wasn't able to know exactly where he was at. All the fans in the front row started singing to help him. Axl went to Bumblefoot to ask him for help. And Ron pointed at us and told him to follow us. A great team work!"